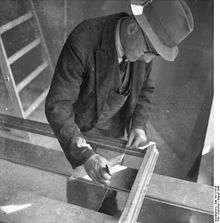 A glazier is a skilled tradesman responsible for cutting, installing, and removing glass (and materials used as substitutes for glass, such as some plastics). Glaziers may work with glass in various surfaces and settings, such as windows, doors, shower doors, skylights, storefronts, display cases, mirrors, facades, interior walls, ceilings, and tabletops. Add weather seal or putty around pane edges to seal joints. 12. Services specialty glass and products. Tools used by glaziers "include cutting boards, glass-cutting blades, straightedges, glazing knives, saws, drills, grinders, putty, and glazing compounds." Some glaziers work specifically with glass in motor vehicles; other work specifically with the safety glass used in aircraft. Glaziers are typically educated at the high school diploma or equivalent level and learn the skills of the trade through an apprenticeship program, which in the U.S. is typically four years. In the U.S., apprenticeship programs are offered through the National Glass Association as well as trade associations and local contractors' associations. Construction-industry glaziers are frequently members of the International Union of Painters and Allied Trades. In Ontario, Canada, apprenticeships are offered at the provincial level and certified through the Ontario College of Trades. The Trade of Glazier is a designated Red Seal Trade in Canada. Occupational hazards encountered by glaziers include the risks of being cut by glass or tools and falling from scaffolds or ladders. The use of heavy equipment may also cause injury: the National Institute for Occupational Safety and Health (NIOSH) reported in 1990 that a journeyman glazier died in an industrial accident in Indiana after attempting to use a manlift to carry a thousand-pound case of glass which the manlift did not have capacity to carry. According to the Occupational Outlook Handbook, there are some 45,300 glaziers in the United States, with median pay of $38,410 per year in 2014. Two-thirds of Glaziers work in the foundation, structure, and building exterior contractors industry, with smaller numbers working in building material and supplies dealing, building finishing contracting, automotive repair and maintenance, and glass and glass product manufacturing. Among the 50 states, only Connecticut and Florida require glaziers to hold a license. 1 2 3 4 5 6 Elizabeth H. Oakes, Ferguson Career Resource Guide to Apprenticeship Programs (Infobase: 3d ed., 2006), p. 356. 1 2 Glaziers (profile in the Occupational Employment Statistics of the Bureau of Labor Statistics of the United States Department of Labor. 1 2 3 4 5 6 7 Glaziers, Occupational Outlook Handbook, United States Department of Labor. ↑ Canada, Employment and Social Development. "Red Seal : Appendix F – Task Profile Chart". www.red-seal.ca. Retrieved 2016-10-27. ↑ Canada, Employment and Social Development. "Red Seal : Glazier". www.red-seal.ca. Retrieved 2016-10-27. ↑ Journeyman glazier dies after being catapulted from manlift - Indiana, National Institute for Occupational Safety and Health (April 1990, 1-7), NIOSHTIC No. 20024470.